The Wonderful World of Fiber! You may not be surprised to learn that wool is one of our favorite fibers when it comes to spinning - after all, it's in our name! With literally thousands of sheep breeds on the planet, there are limitless possibilities for adventurous spinners. Have you heard of Herdwick? These sheep are native to the mountains of England, making them a hardy sheep that produces a hard-wearing, distinctive grey fleece. The Welsh sheep is another rare breed from Britain that you may like to try; the fleece of this particular sheep has a lot of character, but is surprisingly easy to spin. When you're ready to really expand your fiber horizons, there are plenty of interesting options for you to try outside of the sheep pastures. 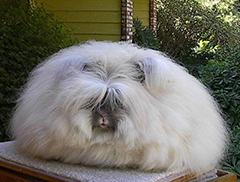 Angora is a type of fiber that can often be confusing to fiberphile beginners. This soft, silky fiber is produced from the adorable angora rabbit and boasts exceptional heat retention (we'll talk about angora goats in a moment!). While it can be a bit of a challenge to spin, it is more than worth the effort. Angora also blends well with other fibers, which makes it easy to introduce into your spinning repertoire. On the other hand, the humble angora goat produces a somewhat misunderstood fiber called mohair. For starters, it often has a bad reptuation as a scratchy or irritating fiber, causing folks to avoid mohair yarns at all costs. Those of you who are willing to give mohair a second try will not be disappointed, however: high-quality mohair is unbelieveably soft yet strong with a gorgeous sheen. For a real treat, kid mohair is a must to try: the first shearings yield the softest, finest fiber. Another common myth is that mohair is difficult to spin. The reality is that it is simply different to spin when compared to wool: the fibers are a bit more slippery and require more tension on your brake, but the long staple length of mohair will aid your on your quest. Yak down is warmer than wool and as soft as cashmere; durable, lightweight, and hard-wearing, it is a hypo-allergenic fiber, making it an ideal choice for those with an allergy to wool. The muskox produces a downy soft undercoat called qiviut, which is softer than cashmere and hypo-allergenic. It is also non-shrinkable and non-feltable - truly an 'easy care' fiber! 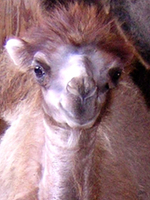 Bactrian Camels from Mongolia produce a soft, downy undercoat that is quite insulating yet lightweight. It is also excellent for felting!